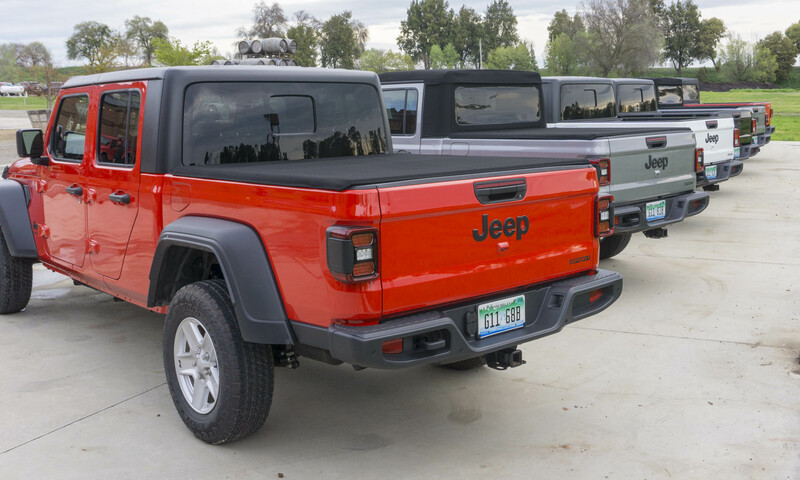 For much of Jeep’s history, the brand has had a pickup truck offering, but it has been a long 27 years since the last Jeep truck. 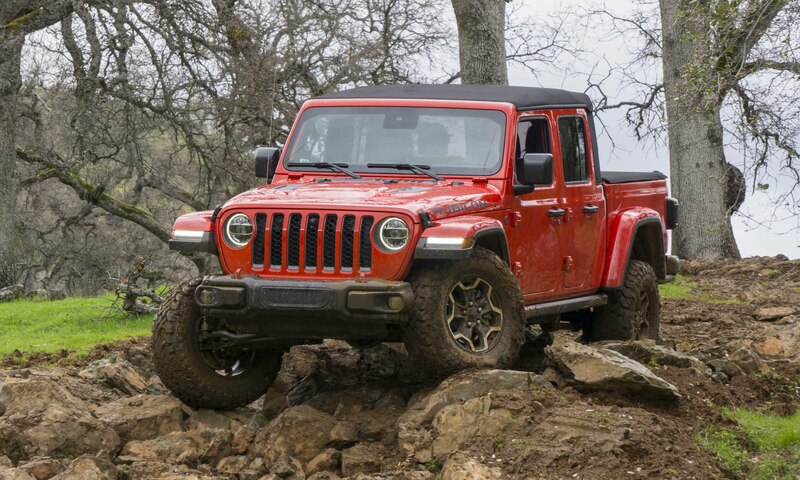 That all changes with the introduction of the all-new Jeep Gladiator. 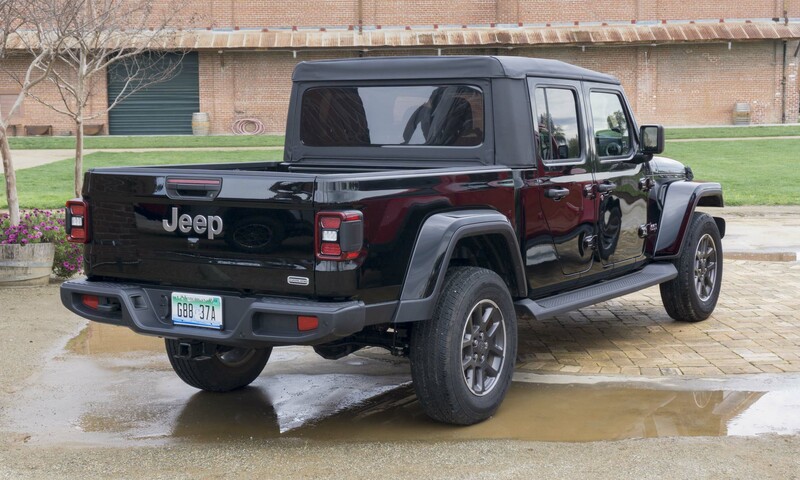 It may look like Jeep just took a Wrangler and put a pickup truck bed on the back, but the Gladiator is much more than that. 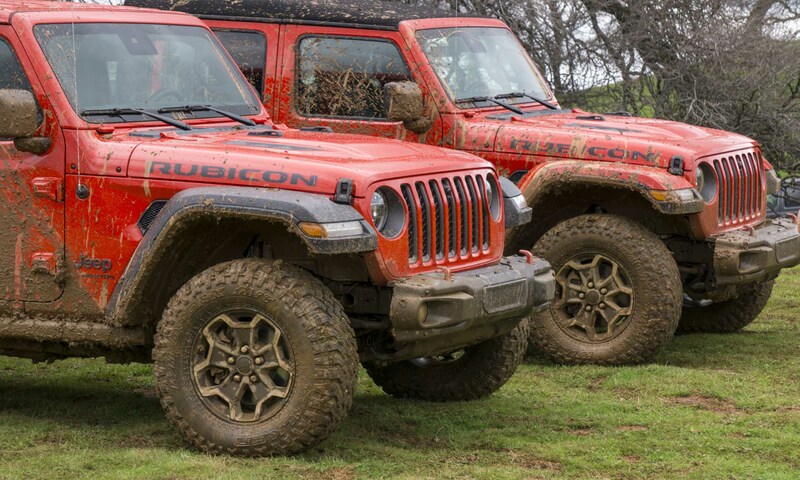 In fact, the Wrangler and Gladiator only share about 50 percent of their parts. 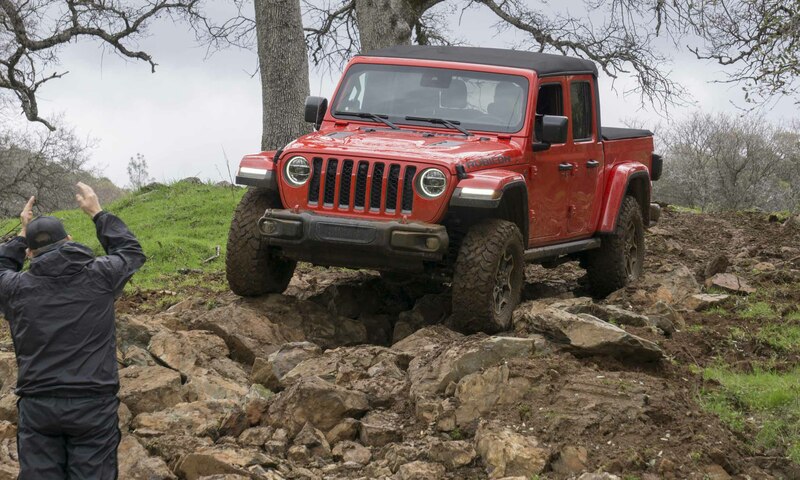 The new truck still carries the attributes and standout features of the Wrangler — including its legendary off-road capability, open-top driving, and even the removable doors and folding windshield. But it is also a proper truck with the utility and equipment to match or exceed all other midsize trucks on the market. 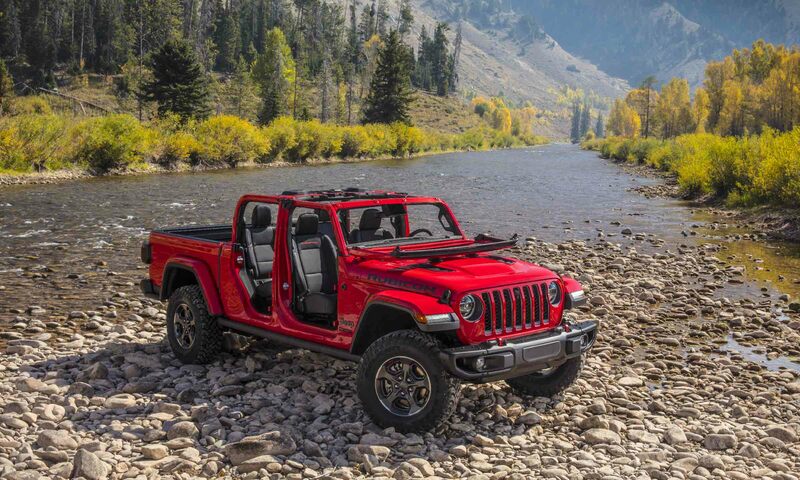 “Unquestionably a truck and instantly recognizable as a Jeep, the all-new 2020 Gladiator is the ultimate vehicle for any outdoor adventure,” said Tim Kuniskis, head of Jeep brand in North America. 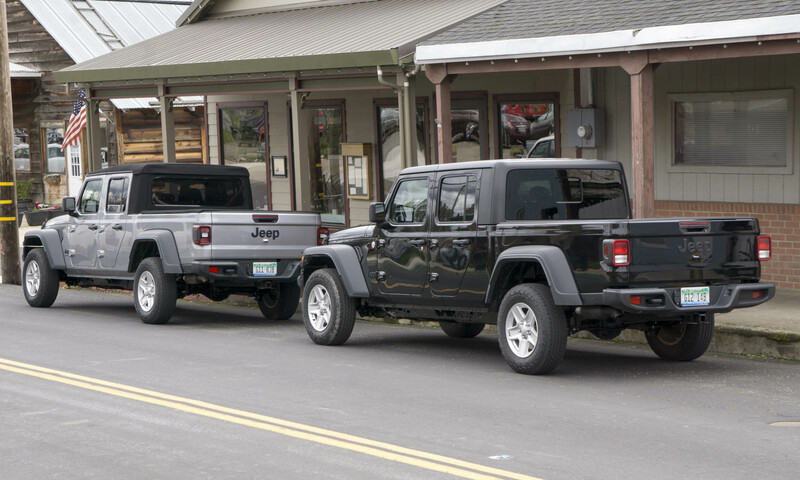 “There is tremendous demand for this unique vehicle from our loyal Jeep customers and pickup truck buyers everywhere. 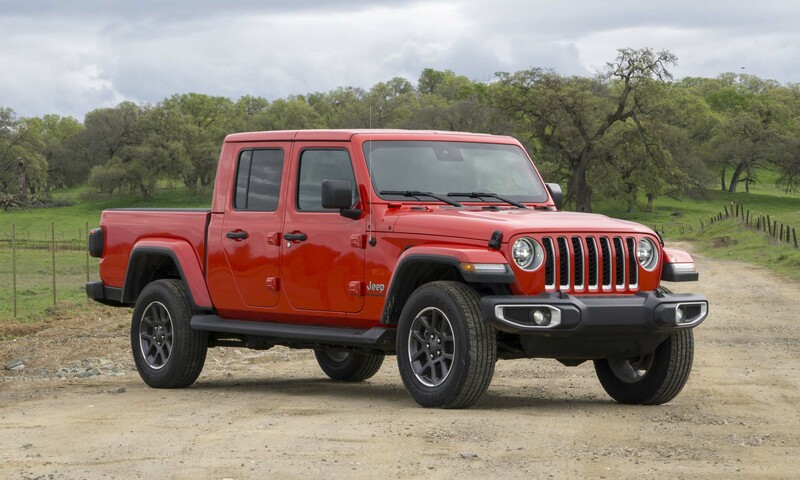 Born from a rich and proud heritage of tough, dependable Jeep trucks, Gladiator combines rugged utility, versatility and functionality resulting in the most capable midsize truck ever,” Kuniskis said with pride. 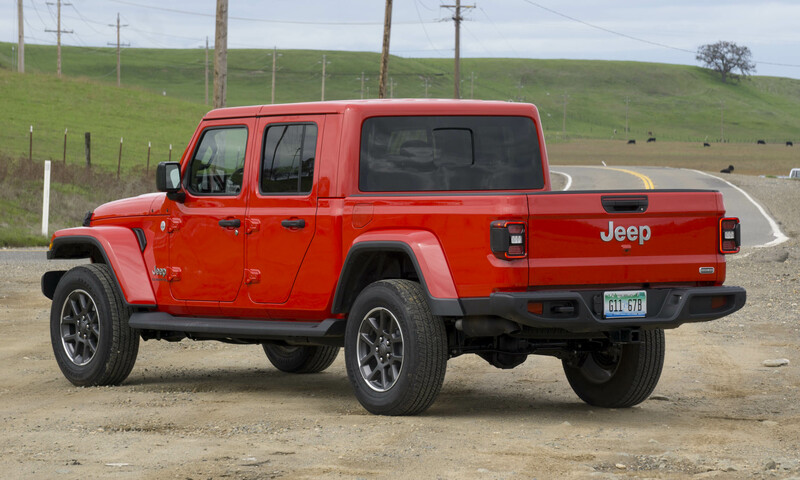 Jeep is offering the new 2020 Gladiator in four trim levels: Sport, Sport S, Overland and Rubicon. A limited run of a special Launch Edition will also be available. 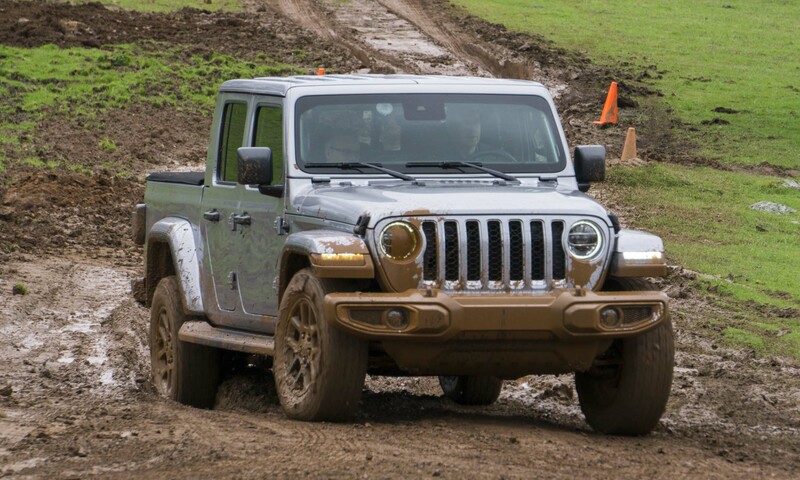 All Jeep Gladiators come with 4-wheel drive and a 6-speed manual transmission as standard equipment. 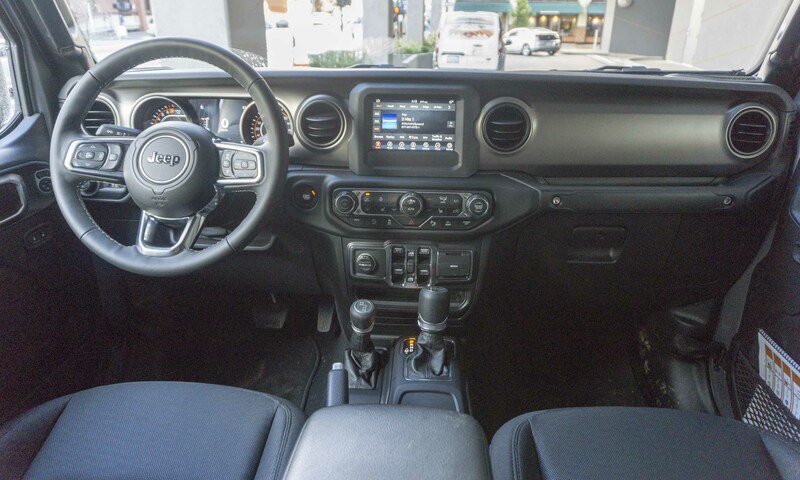 With a base price starting at $33,545, the Gladiator Sport comes with air-conditioning, a pushbutton start with weatherproof surround, a 5-inch display screen, two USB ports, a rearview camera and — in a bit of a throwback — manual locks and roll-up windows. 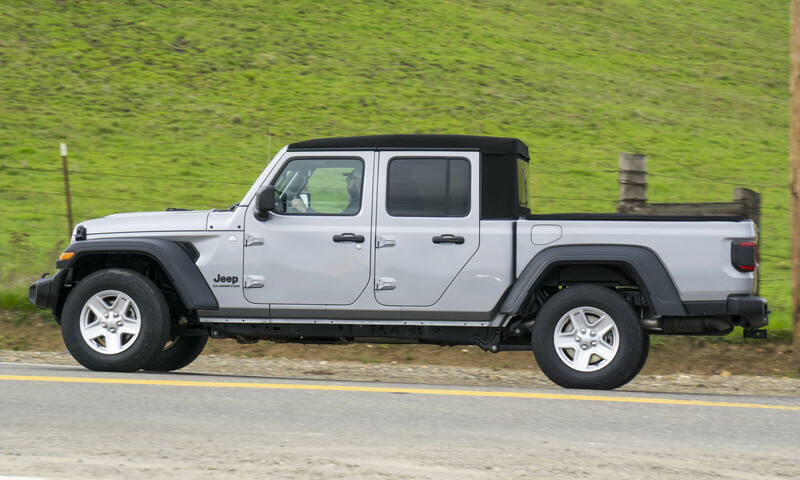 Gladiator Sport also comes standard with the Sunrider folding soft-top, a tow hitch with wiring, trailer sway control, skidplates, fog lights and 17-inch steel wheels. 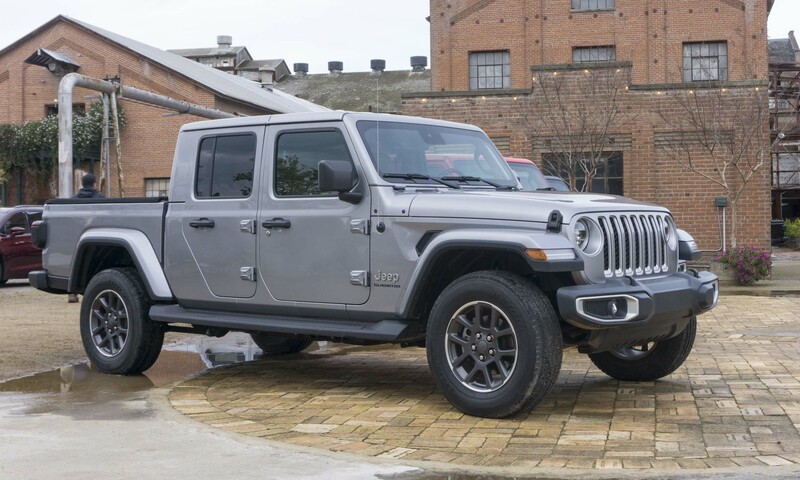 Priced at $36,745, the Gladiator Sport S upgrades the Sport with power windows and door locks, remote keyless entry, automatic headlights, a leather-wrapped steering wheel and 17-inch aluminum wheels. 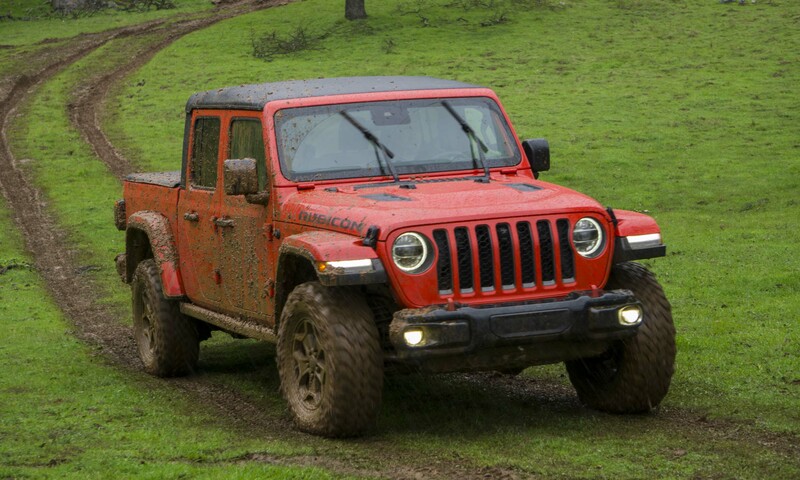 The Overland is the premium-level trim of the Gladiator with a price that bumps up to $40,395. Upgrades over the Sport S include automatic dual-zone climate control, a 115-volt power outlet, a 7-inch display, two USB ports in the back seat, side steps and 18-inch aluminum wheels. 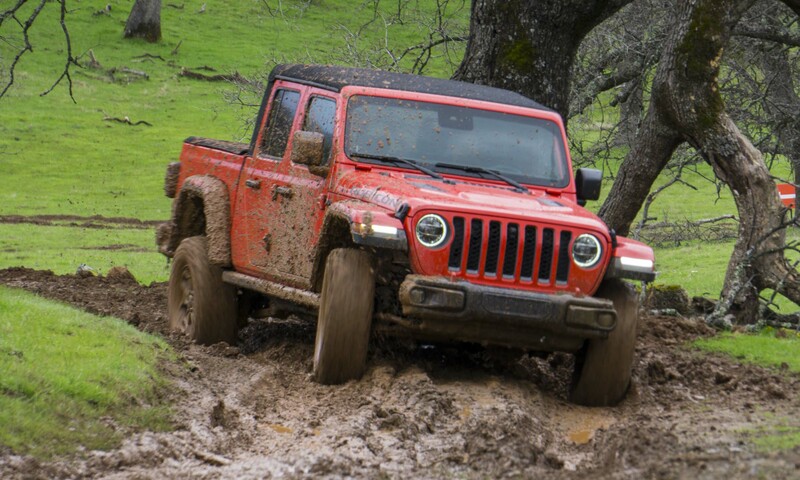 For those who seek the most rugged and capable variant in the Gladiator lineup, that would be the Rubicon. 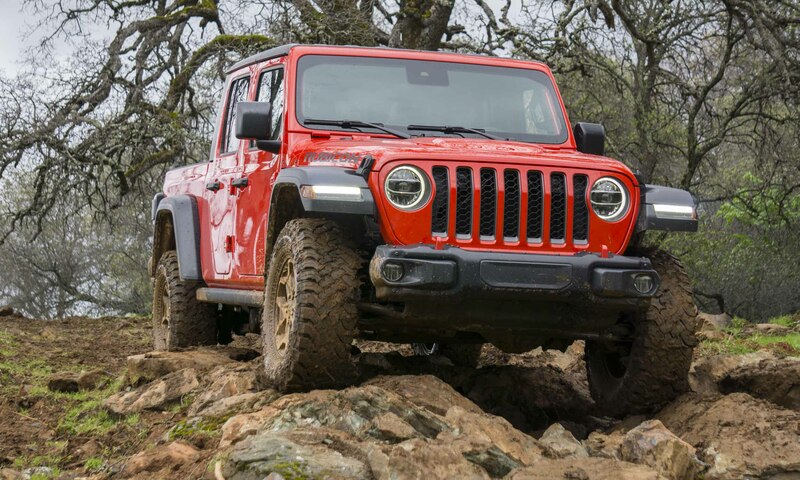 With a starting price of $43,545, the Rubicon adds wide-track front and rear axles, front and rear locking differentials, sway-bar disconnect, Fox monotube shocks, high-clearance fender flares, rock rails, a front skidplate / brush guard, front and rear tow hooks and 17-inch wheels shod with Falken Wildpeak A/T tires. 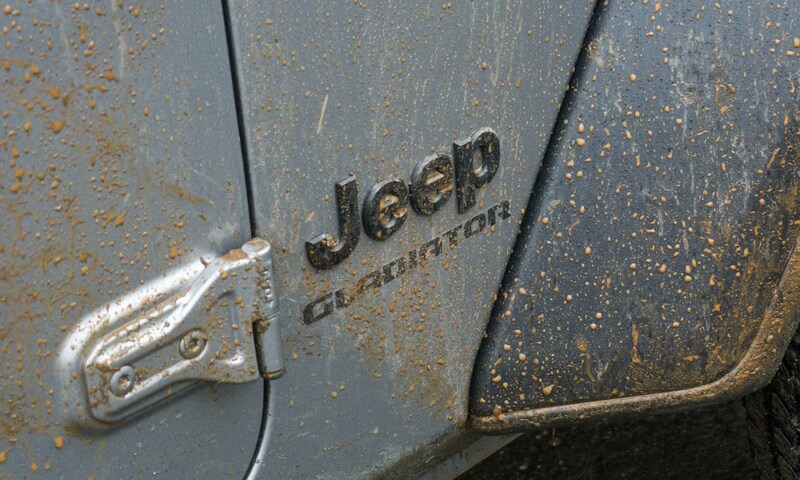 A limited run of special Gladiators is planned for the launch of this new Jeep. 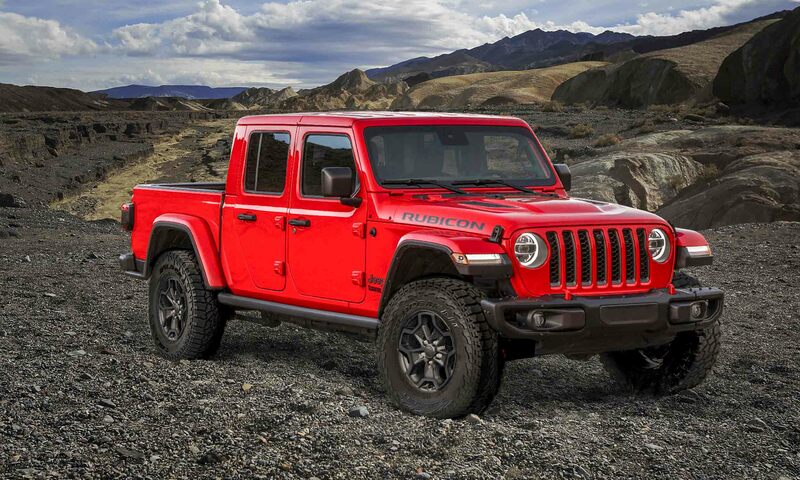 Only 4,190 will be built — a callout to the 419 area code in Toledo, Ohio, where Gladiator and Wrangler are built. With a starting price of $60,815, the Gladiator Launch Edition is based on a fully-loaded Rubicon with unique badging, wheels and interior accents. Also included are the 33-inch Falken Wildpeak A/T tires on 17-inch aluminum wheels, black leather seats with red accent stitching, a 9-speaker Alpine premium audio system, an 8.4-inch touchscreen display, a forward-facing trailcam, automatic emergency braking, adaptive cruise control, a spray-in bedliner and the Trail Rail Cargo Management System. When the Gladiator arrives in showrooms it will have no optional engines. 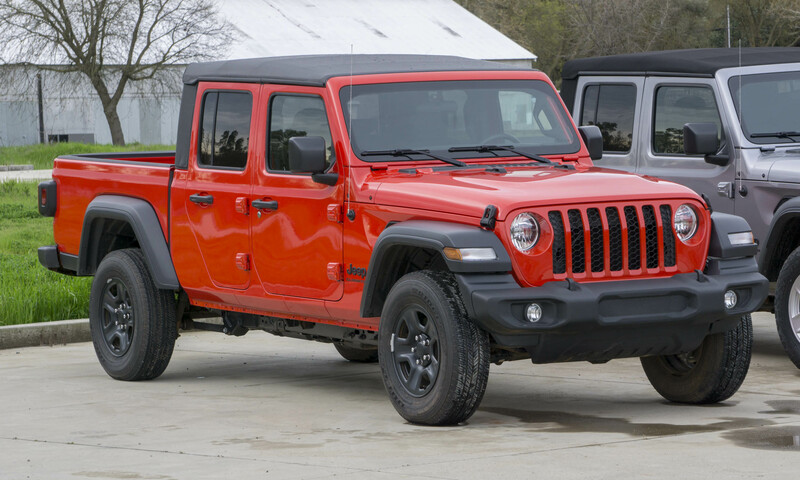 The unit powering all Gladiators will be a 3.6-liter Pentastar V6 engine producing 285 horsepower and 260 lb-ft of torque — the same powertrain used in the Jeep Wrangler. 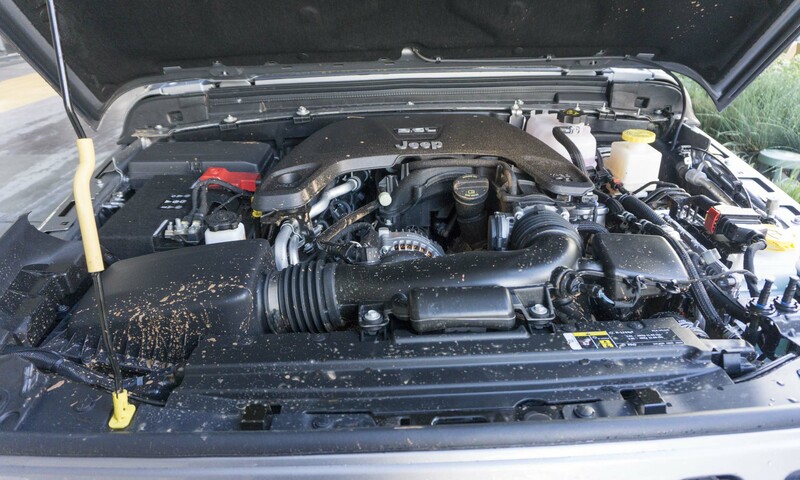 There are plans to eventually offer a 3.0-liter EcoDiesel V6 in the Gladiator; however, the diesel will not be available until sometime in 2020. With the V6 powerplant Gladiator can haul up to 1,600 pounds of cargo or tow up to 7,650 pounds. 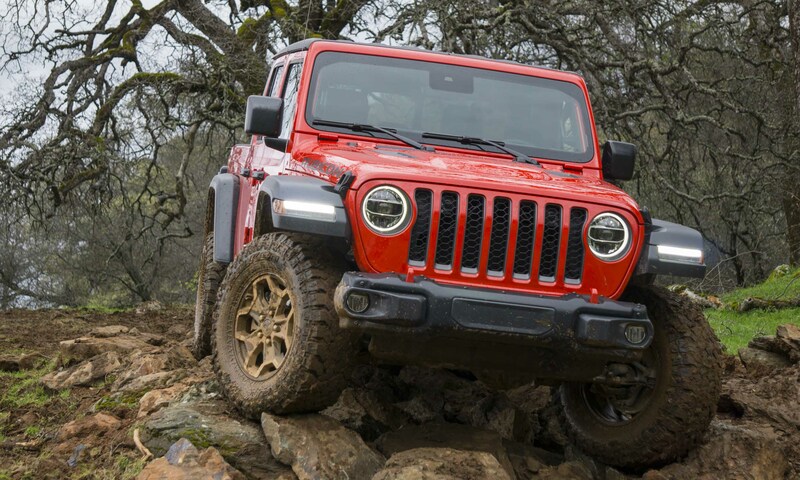 In an unusual move, Jeep has made a 6-speed manual gearbox standard on all Gladiators. This means it is possible to get a fully-loaded Gladiator Overland or Rubicon with a manual. 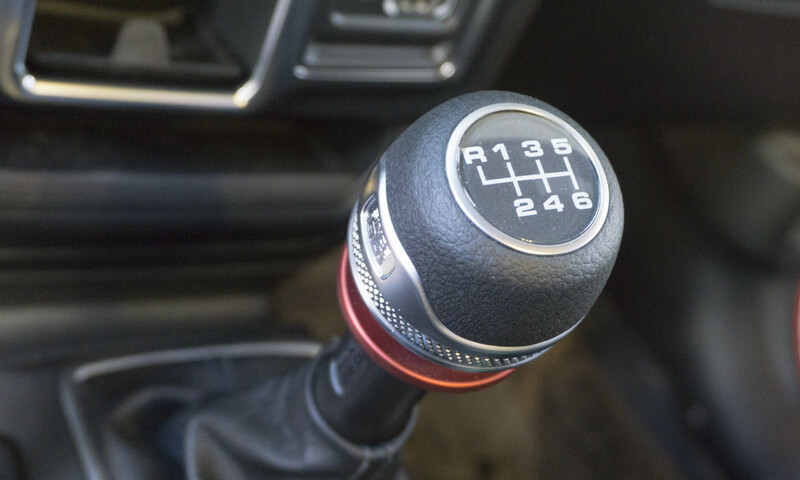 An 8-speed automatic transmission is available for all trim levels, priced at $2,000. Fuel economy is respectable for a 4WD pickup truck: EPA ratings are 17 mpg city / 22 mpg hwy / 19 mpg combined for the 8-speed automatic transmission. The manual gearbox is slightly less efficient in the city at 16 mpg, slightly better on the highway with a rating of 23. We observed around 20 mpg with the automatic transmission during our drive around northern California, so numbers seem to be realistic. 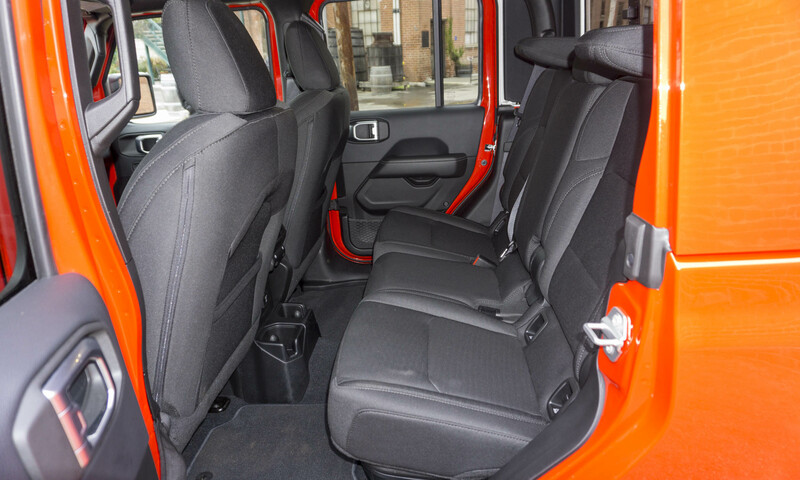 All Gladiators are crew cab models with seating for up to five passengers. As mentioned previously, several different display screens are available for Gladiator, all of which integrate nicely in the dash. The dual cupholders in the center console also feature a slot that fits a smartphone. The doors have small net pockets, but their tiny size means they won’t hold very much. Overall controls are easy to access and quite intuitive (always happy to see volume and tuning knobs). 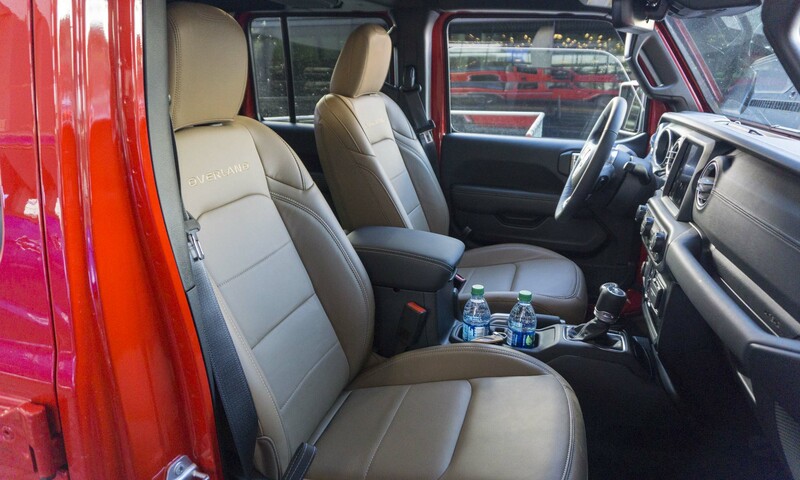 Gladiator also has grab handles at each door, as well as one facing the front passenger — for when the going gets rough. The outboard positions of the rear seat offer comfortable space with plenty of legroom and headroom. Middle-seat passengers have limited legroom due to center-mounted cupholders near the floor. Rear seatbacks can be folded down, which provides a flat platform for storage, or the seat bottoms can be folded up to increase floor space. 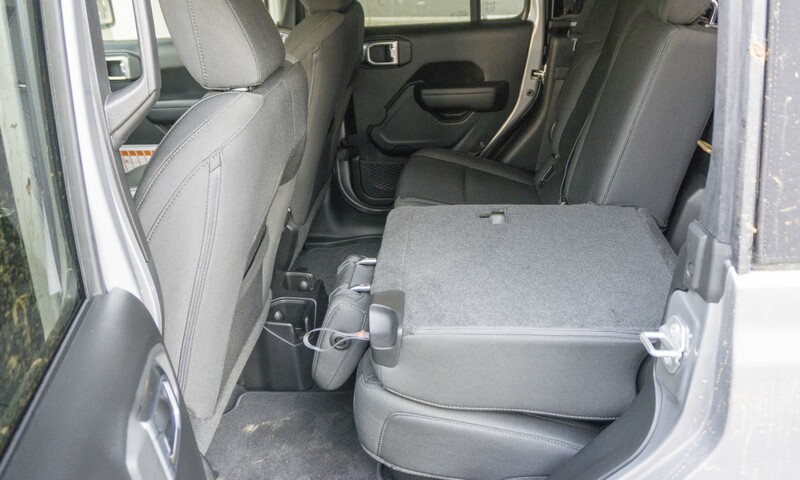 Beneath the rear seat resides a standard storage space that can be upgraded to a lockable storage bin — a handy feature if the vehicle is parked with the doors removed. Speaking of removal, one of the features that really sets Gladiator apart from any other pickup truck on the market is the opportunity for open-air motoring. The Sunrider soft-top is standard and easily folded back; or customers can opt for the Freedom hardtop with three removable panels. For the ultimate outdoor experience, doors can be removed and the windshield folded down onto the hood. 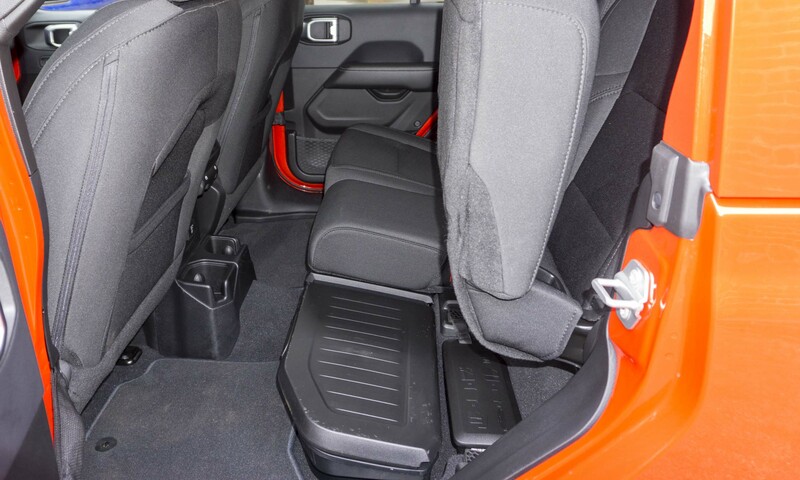 Gladiator even has small box mounted in the rear seat, designed to hold all screws and bolts so reassembly is easy. 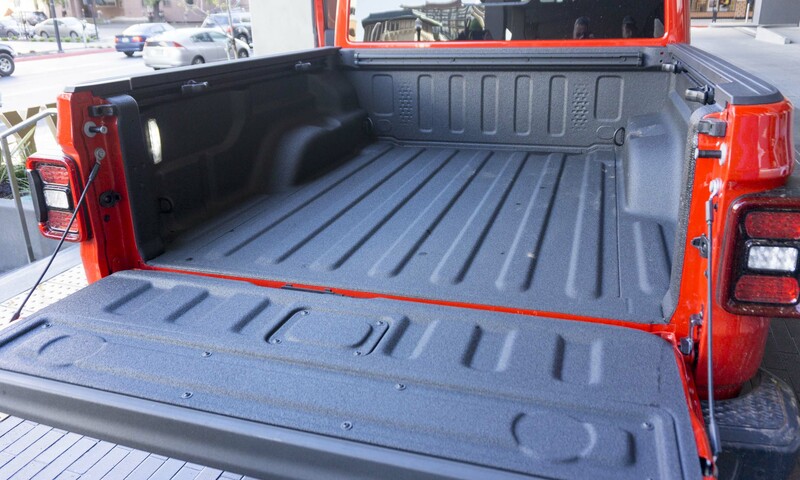 A 5-foot cargo bed is the only option for Gladiator, and it is made of high-strength steel. The lockable tailgate is aluminum and action is damped, which makes it easy to raise and lower. Adding versatility are available features such as box rails with four adjustable tiedowns, under-rail bed lighting, a 115-volt power outlet and a spray-on bedliner. The tailgate can be positioned partially lowered that matches the height of the wheelwells, allowing longer cargo to stay level, resting on the wheelwells and tailgate. 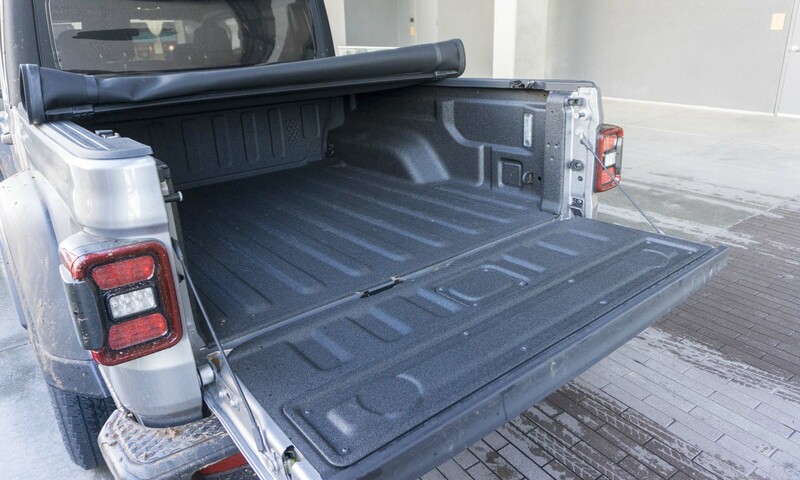 The cargo bed can also be secured with an optional soft tonneau cover. The cover can easily be rolled and strapped behind the truck cab. It may be designed to excel off road, but the Gladiator is actually quite comfortable on pavement. The ride is smooth — surprisingly, there wasn’t any bounciness that often occurs with empty-bed pickup trucks. The cabin remained nice and quiet without much wind or road noise — even with the soft-top. The Gladiator won’t win any races — at least on the road — although acceleration is good. The automatic transmission shifts quickly and smoothly, and as we said previously, we experienced around 20 mpg during our test drive. Surprisingly the Gladiator handles winding roads rather well — steering is precise and although there is some body lean, overall the truck performs quite admirably. We spent a short time in a Gladiator equipped with the manual gearbox, and were happy with the performance. The clutch pedal has lengthy travel, which makes it necessary to sit closer to the wheel than we’d prefer, but we like the feel of the shifter. Many car companies only offer a manual gearbox in the most basic trims, so it’s nice to see Gladiator with an available manual at all trim levels. 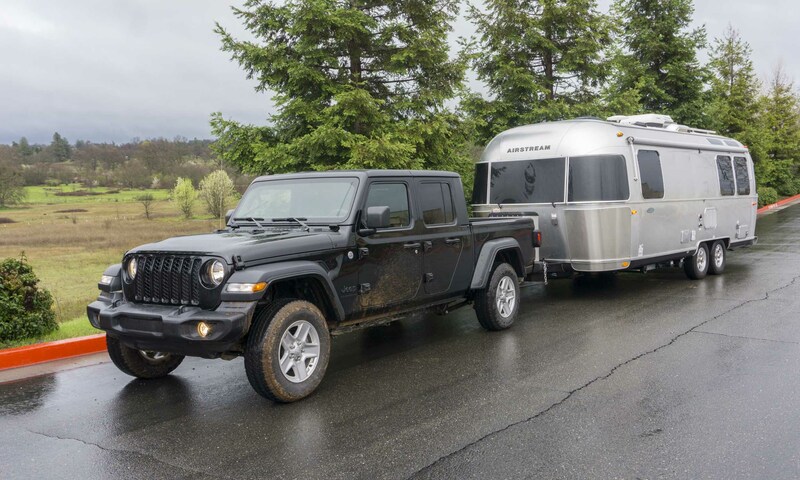 In addition to its off-road prowess, the new Gladiator is also configured for doing other chores such as towing. When properly equipped with the Max Trailer Tow Group (only available on the Sport), the Gladiator can pull up to 7,650 pounds. 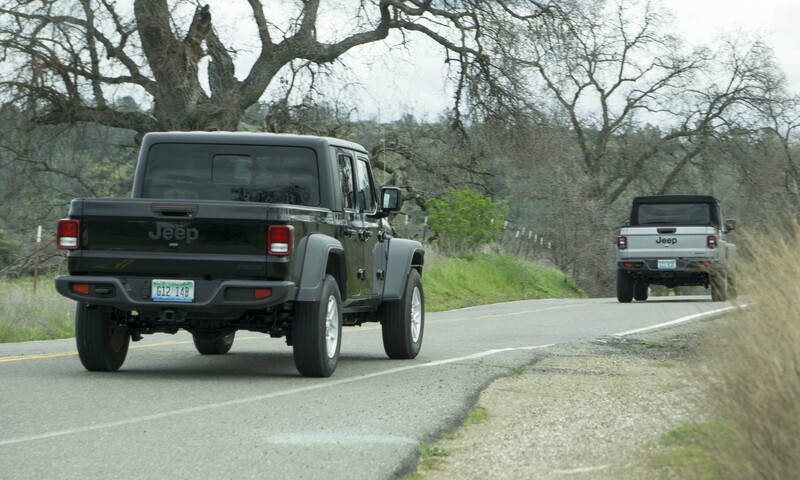 The Gladiator’s grille is wider than the Wrangler’s to increase cooling during towing. 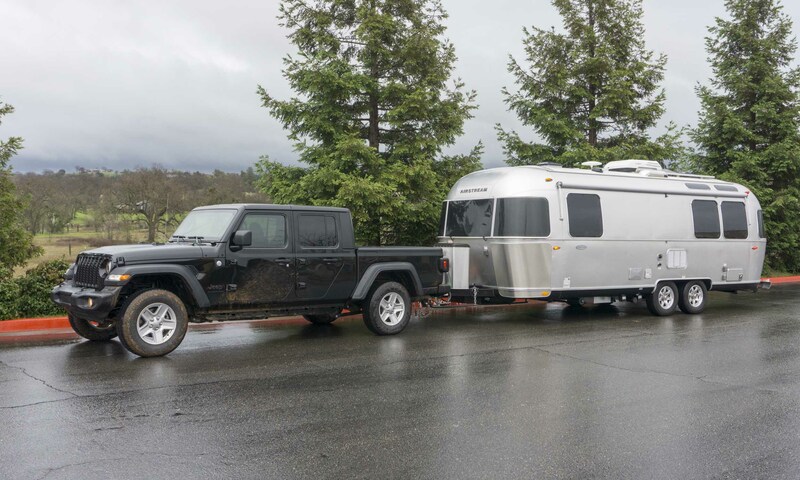 We took a short drive in a properly-equipped Gladiator pulling a 5,500-pound Airstream trailer. 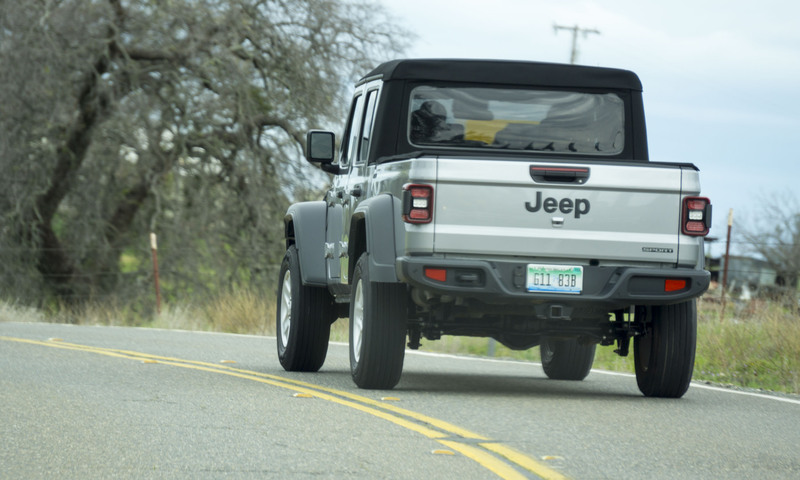 The Jeep has more than adequate power to accelerate uphill and cruise at 60 mph even with a big trailer behind it, and the transmission adjusts to the load, keeping the truck in gear longer for better acceleration. However, small mirrors made it impossible to see around the trailer. Bigger mirrors (or aftermarket mirror extensions) would help that. During the tow portion of our drive we also felt the truck bouncing a bit more than we would like, exhibiting what some might call a nervous ride. 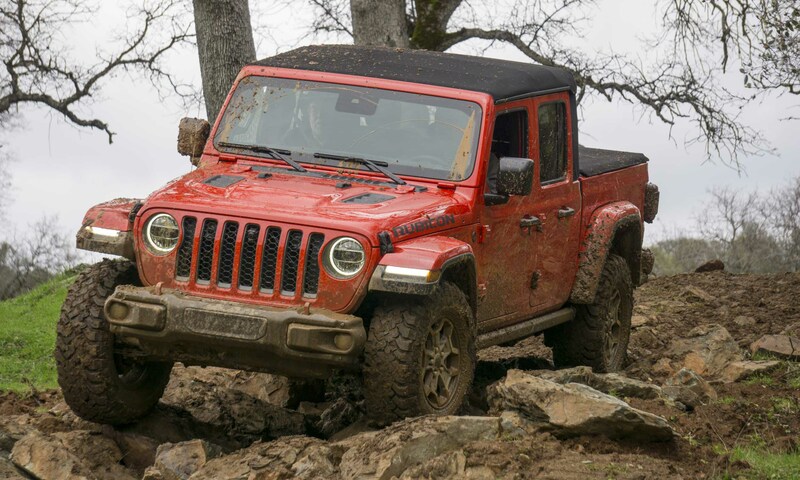 While the Gladiator’s capabilities compete closely with other compact pickup trucks on the market, there really isn’t another truck that can do what a Jeep can when it comes to extreme off-roading. 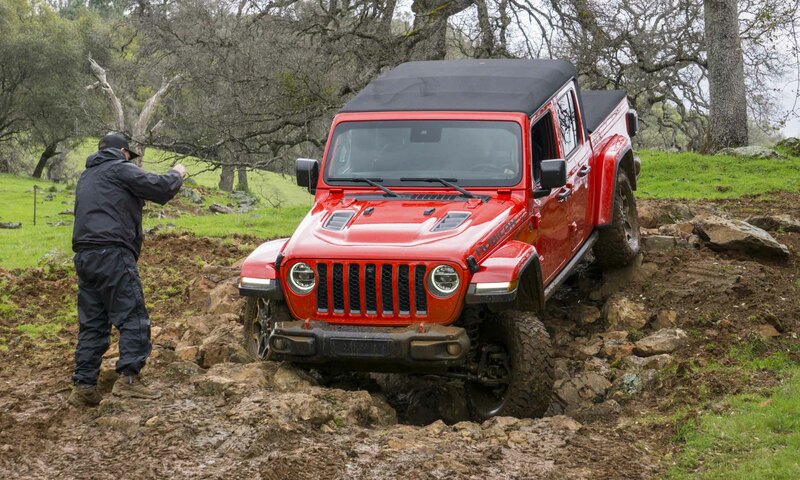 Jeep set up an off-road course in Cool, California, that included deeply-rutted tracks, very slimy mud and steep rocky hills. Add to this an incredibly rainy day to create terrain not suitable for most vehicles. 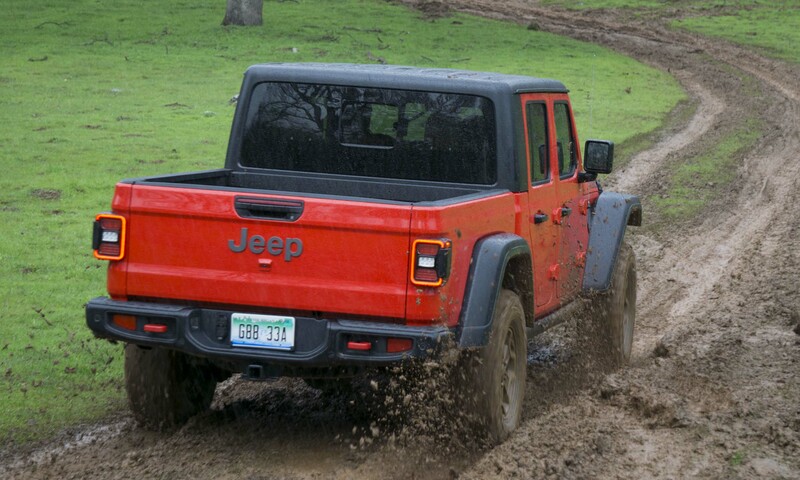 But it was just fine for a Jeep Gladiator. We drove the Rubicon outfitted with the optional Falken Wildpeak M/T tires and automatic transmission. Throughout the course we changed from 4 High to 4 Low, as well as disconnected the sway bar and locked the front and rear differentials as needed. 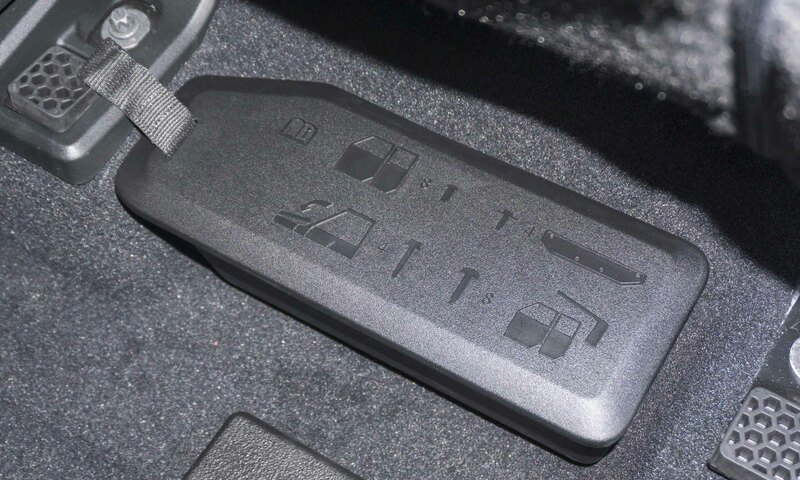 These vastly affect how the Jeep keeps traction on uneven, slick terrain, and these changes are accomplished with the ease of pushing a button or shifting a lever. Even with spotters in front to help direct, the rocky areas of the course were quite challenging to maneuver; however the Gladiator never faltered. 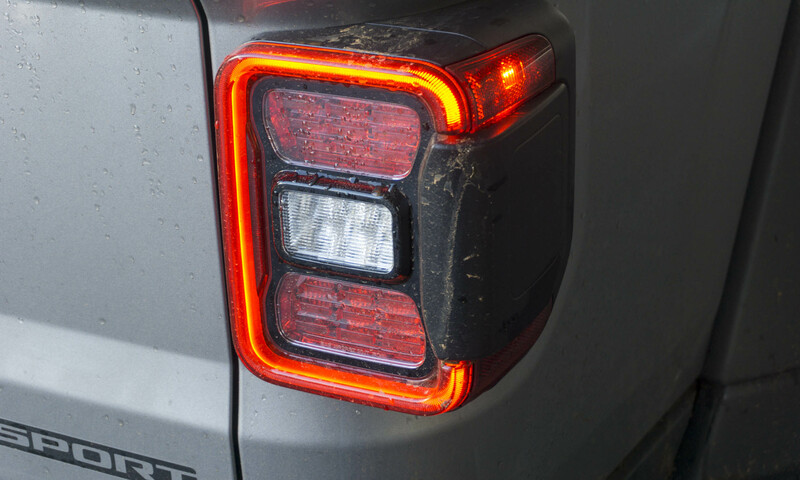 There were a few occasions when the tires slipped on mud-covered rocks, causing the rock rails that line the frame to scrape — which makes a horrible sound as if the vehicle is being badly damaged. However, as Jeep staffers pointed out, that’s why the rails are there. 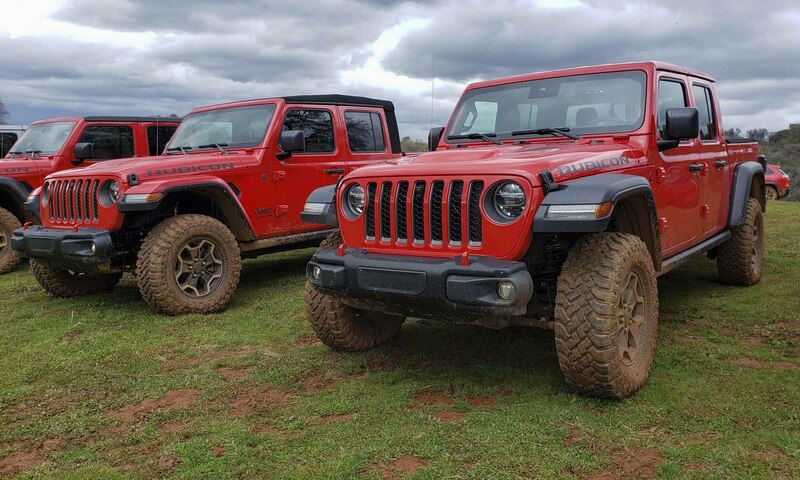 Even though the Gladiator is 30 inches longer than the 4-door Wrangler Unlimited, it matches the legendary Jeep’s capability in almost every respect. 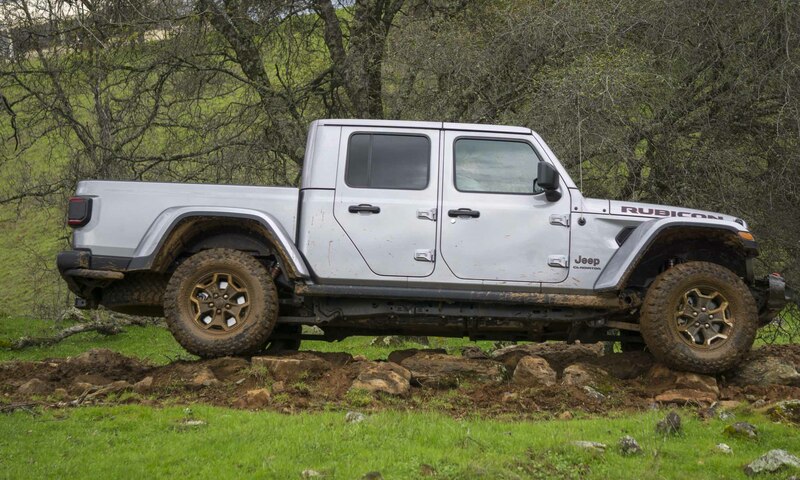 The Gladiator Rubicon has an approach angle of 43.4 degrees; however, the longer body makes the departure angle a bit lower — 26 degrees versus 37 degrees in the Wrangler. 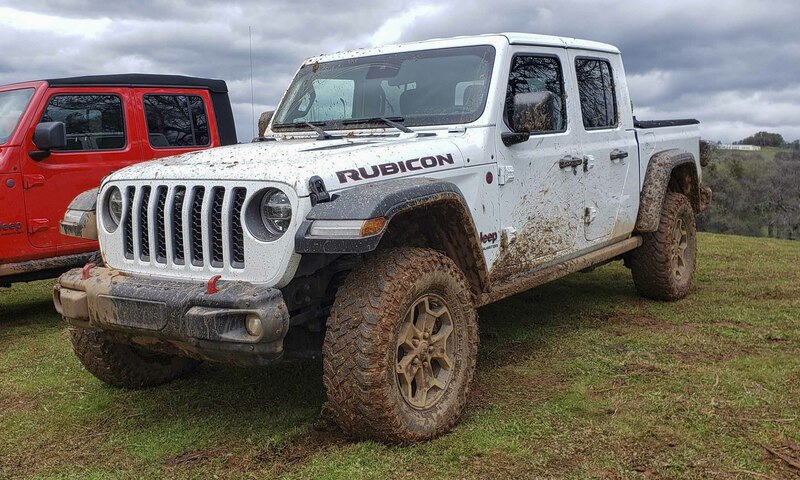 Gladiator Rubicon boasts more than 11 inches of ground clearance, while other versions are at a still-respectable 10 inches. Gladiator can also traverse up to 30 inches of water. 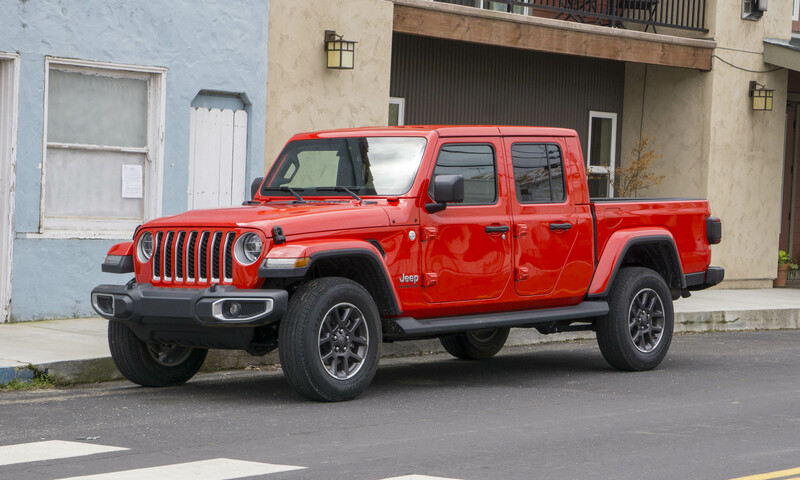 After a bit of a lull a few years back, a number of midsize trucks have entered the market, but the new Jeep Gladiator will have no trouble standing out from the crowd. 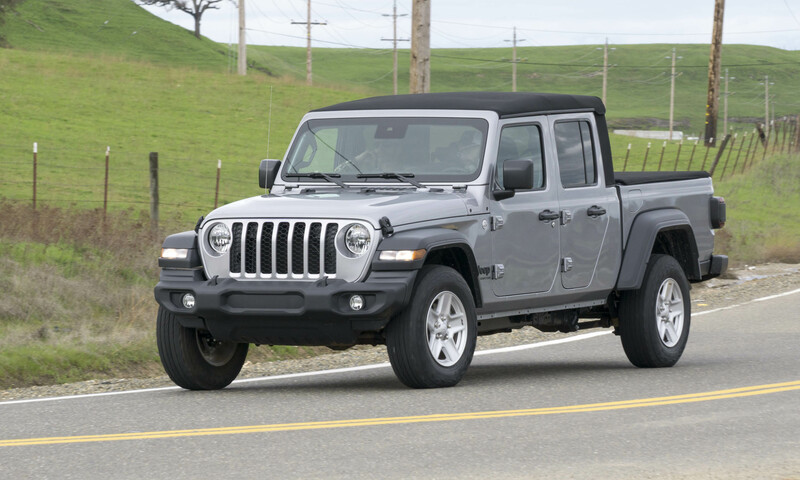 In addition to its iconic Jeep styling, the Gladiator is the only pickup that has a removable roof and doors, as well as standard 4-wheel drive and outstanding off-road capability while still providing the versatility expected of a midsize pickup. 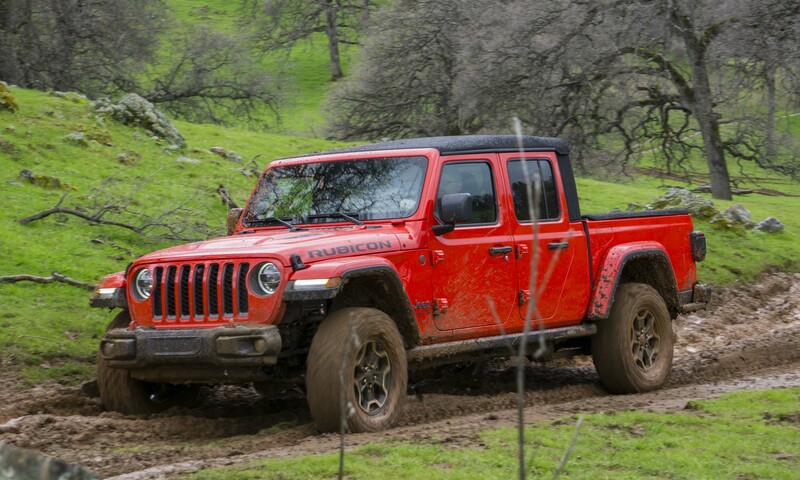 For the consumer who wants the capability of a Wrangler and the utility of a pickup truck, the Gladiator manages to combine these qualities without diminishing either of them. Pros: Outstanding off-road capability; spacious cabin; excellent cargo storage options. Cons: Small rearview mirrors; only 5-foot bed; extra cost for advanced safety features. 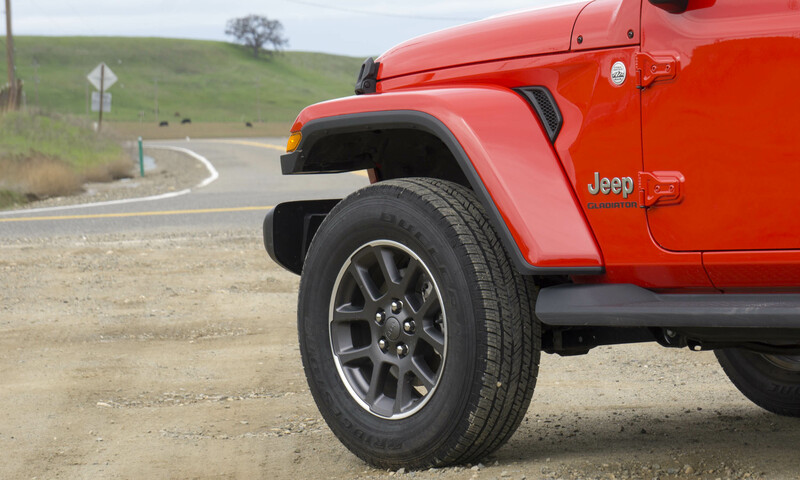 Bottom Line: The capability of a Jeep with the utility of a pickup in a stylish, comfortable package. 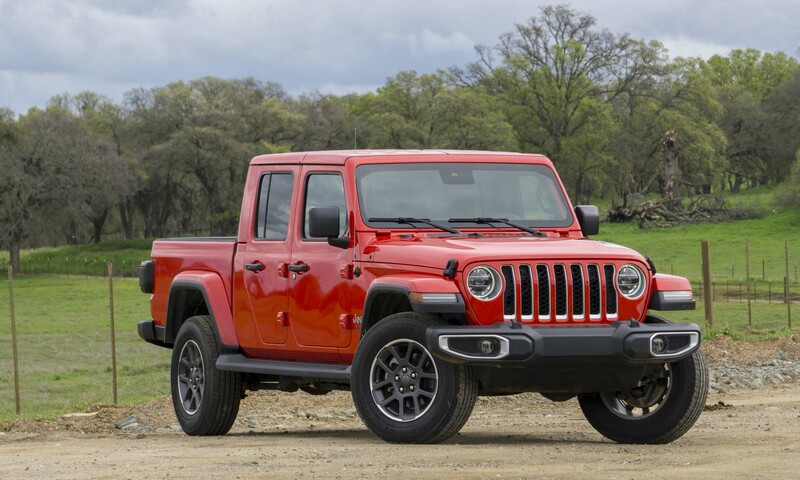 The post 2020 Jeep Gladiator: First Drive Review appeared first on autoNXT.net.